A crowd of us had decided to spend the evening celebrating – a bachelorette party the night before a wedding. Our destination: Lips, a restaurant with a twist. 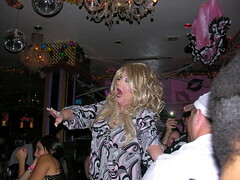 “Female impersonators” both served and entertained. And, what a show!Let’s say upfront that this is not the place to bring young, impressionable children. The proliferation of four letter words and the performer’s acts are meant for an adult audience. That said, on to the fun! 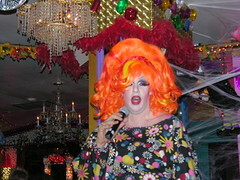 They call themselves “the ultimate in drag dining,” but Lips is anything but a drag (I know, bad pun there!). We had a very tall performer serving us our dinner, “All Beef Patty,” who did an admirable job serving, but a truly wild time entertaining. The risqué and outrageous is the norm, but everyone is having a good time. Audience participation is expected and some of the participation involves desserts and crowns. The food is fine, with the flounder picatta with capers and herbs in butter sauce, veggies and rice (“Coco La Chine”) I ordered nicely prepared. The menu items are named after the performers – or, is it the other way around? Everything from chicken to seafood to pasta to beef is available with all of the trimmings. Lips has two seatings for dinner and a show during the week Tuesdays through Thursdays and Sundays, three seatings on Fridays and Saturdays. Reservations are expected, since people come in groups of 10 or more. I was surprised to learn that they also have locations in San Diego and Fort Lauderdale. Probably equally outrageous, I can’t vouch for those other locations, but I know my trip to Lips certainly fulfilled the promise – “the ultimate in drag dining.” I can’t say I’ve ever had quite as wild an evening and more unusual entertainment. Those queens really put on a show! Lips in NYC is open six nights a week and has a Gospel Brunch on Sundays. They’re located at 2 Banks Street in the West Village, Manhattan. This entry was posted on Wednesday, November 11th, 2009 at 6:00 am	and is filed under Entertainment - Adult, Food, New York City - Manhattan, Restaurant. You can follow any responses to this entry through the RSS 2.0 feed. You can leave a response, or trackback from your own site.